Found 8 file extension associations related to Mozart and 3 file formats developed specifically for use with Mozart. Mozart the music processor is music notation software for computers running Microsoft Windows. 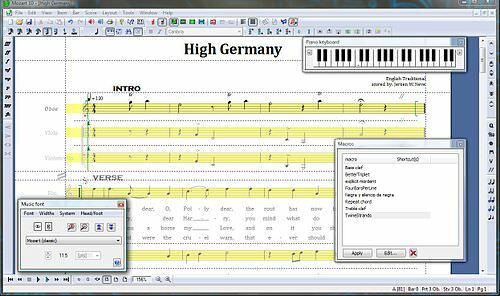 Mozart allows users to type in music notation - as easily as entering text in a word processor - view it on the screen, hear it, edit it, and then print high quality music scores and individual parts for musicians. Mozart's in-built knowledge of music syntax lets you create scores and parts quickly and efficiently. These pages contain lots of information about mozart: lists of features; illustrated examples; what you need to run it; how to download the evaluation copy; how to buy the full Virtuoso Edition. If you need more information please contact the developers of Mozart (David Webber), or check out their product website.